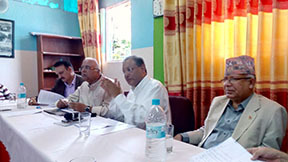 Kathmandu, 6th September 2015: Dr Hasan Mahmud MP, the Chairman of Parliamentary Standing Committee on Ministry of Environment and Forest of Bangladesh urges South Asian civil societies to develop mass awareness on regional togetherness and common issues in the region so that politicians can work together. Mr. Hasan speaks while chairing the concluding session of the three-day meeting of South Asian CSO andParliament Leaders on Strategies towards SDG Summit and CoP (Conference of Parities) 21 at Paris. The meeting is held at Hotel Crown Plaza of Kathmandu, Nepal organized by Beyond Copenhagen and Pairvi of Delhi. It is to mention that, UN general assembly is going to adopt the Sustainable Development Agenda as the roadmap for the post MDG era and in December this year Paris is going to host the 21st Climate Conference of Parties (COP). This strategic meeting, that’s why, takes place in Nepal to sort out the possible strategies of South Asia in those international negotiations. Mr. Om Thanvi, a senior journalist and the former editor of Janasatta-e-Hind, newspaper from Delhi, moderates the concluding session. The other distinguished speakers of the session are the former Prime Minister of Nepal Mr. Madhab Kumar Nepal, former Energy Minister Dr. Prakash Sharan Mahat and Jorunalist Ajay Dixit, the Editor of Water Nepal. On behalf of South Asian civil society Mr. Soumya Dutta and Mr. Ajay Jha from India, Mr. Hemantha Wathanga from Sri Lanka and Rezaul Karim Chowdhury from Bangladesh speak on the occasion. Mr. Bijoy Prathap from India gives vote of thanks on behalf of the organizers. Former Energy Minister of Nepal Dr. Prakash remarks about the potentialities of energy cooperation in South Asian countries for further advancement of the sub-continent. Former Prime Minister Mr. Madab Kumar Nepal reiterates the need of mass awareness and the unity of the region’s politicians through it to work together addressing the common cause of the member countries.